Transient receptor potential (TRP) channels, which are membranous ion channels that conduct calcium and sodium ions, have been shown to influence cancer cell growth.7,8 These channels can be activated by many stimuli, including temperature or pH changes in the extracellular space.9 TRP channels play an important role in the development of several diseases, and one of the most investigated and described TRP channel is TRPV1.10 TRPV1 agonist, capsaicin, is capable of inducing apoptosis11,12 and inhibiting cancer cell growth by cell cycle arrest in many different types of cancer, for example, osteosarcoma, colon, and pancreatic cancer cells, while normal cells remained unharmed.13–17 A less-pungent capsaicin-like analog, RPF151, showed antitumor activity in a murine breast cancer model in vivo,18 demonstrating the possibility of managing the induction of pain. In this study, we aimed, on the one hand, to elucidate the expression profiles of TRP channels in a large amount of breast cancer tissues via RNA-Seq. On the other hand, we analyzed the expression of TRPV1 in detail to contribute to the understanding of the influences of TRPV1 activation in novel breast cancer therapy. Breast cancer tissues were obtained from Dr Bonatz, Augusta-Krankenanstalt Bochum, and Dr Wölk, Herz-Jesu Klinik Dernbach. Each patient provided written consent and gave permission for the storage of their samples for the use in research and development purposes. Identities were entirely concealed in accordance with the Declaration of Helsinki. The tumor tissue samples were maintained in RNAlater. RNA was isolated from the tumor samples using a homogenizer (Precellys®; Bertin Corp., Rockville, MD, USA) with 1.4 ceramic beads (Precellys®) and with an RNeasy Mini Kit (Qiagen, Hilden, Germany) according to the manufacturer’s protocols. cDNa synthesis was performed using the iScriptTM cDNA Synthesis Kit according to the manufacturer’s protocol (Bio-Rad, Hercules, CA, USA). RT-PCR was conducted to validate the expression of the detected olfactory receptors. PCR was performed using GoTaq qPCR Master Mix. The PCR included the following steps: 3 min, 95°C, 40 cycles of 1 min at 60°C (TRPV1) and 1 min at 72°C. A Mastercycler® ep realplex (Eppendorf, Hamburg, Germany) was used. TRPV1 – forward: CAGGGAAGACCTGTCTGCTG; reverse: ACAAGCTCCTTCAGGCTGTC. Capsaicin was purchased from Sigma-Aldrich (St Louis, MO, USA). The inhibitor capsazepin and the TRP channel inhibitor ruthenium red were purchased from Abcam (Cambridge, MA, USA). Ringer’s solution contained 140 mM NaCl, 5 mM KCl, 2 mM CaCl2, 1 mM MgCl2, and 10 mM (4-(2-hydroxyethyl)-1-piperazineethanesulfonic acid), at a pH of 7.4. The substances were prediluted in dimethyl sulfoxide (DMSO) prior to usage. The final concentration of DMSO solvent was maximally 0.1% for each experiment. For standard mRNAseq (Illumina, San Diego, CA, USA), we used the TruSeqTM RNA Sample Prep Kit v2 protocol (Illumina). HiSeq 2000 (2 × 102 bp reads) was used for RNA-Seq. In total, 11 breast cancer tissue samples were analyzed in cooperation with the Cologne Center for Genomics (CCG). Raw data were generated for breast cancer samples in fastq format. Hg19 of the human genome and transcriptome was used to align the reads. The alignment was arranged by the Bowtie program included in TopHat (version 1.2.0).19 The output files were sorted and indexed by the SAMtools program in BAM format.20 The number of the aligned mRNA-Seq reads was calculated using the Cufflinks program,21 which uses the RefSeq hg19 reference transcriptome in Gene Transfer Format (GTF; obtained from the USCS Genome Bioinformatic database, University of California, Santa Cruz, CA, USA). The Cufflinks program was used for the quantification of the relative abundance of transcripts for each gene, using the unit FPKM (fragments per kilobase of exon per million fragments mapped).21 For visualization of the data sets and the analysis of the read distribution, the Integrative Genomic Viewer was used (www.broadinstitute.org/igv). SUM149PT cells were purchased from Asterand Bioscience (Detroit, MI, USA). The cells were cultivated in Roswell Park Memorial Institute (RPMI) medium containing 10% fetal bovine serum, glutamine (5%) and 100 units/mL penicillin/streptomycin (Gibco®; Thermo Fisher Scientific, Waltham, MA, USA). Cultivation was performed in an incubator with a humidified atmosphere at 37°C in 10% CO2. SUM149PT cells were passaged every 3–4 days at a confluence of 85% using TrypLETM (Thermo Fisher Scientific). SUM149PT cells were incubated at 37°C for 30 min with Ringer’s solution containing 3 mM FURA-2-AM (fura-2-acetoxymethyl ester; Molecular Probes, Eugene, OR, USA). For calcium imaging experiments, the growth medium was replaced by extracellular medium. Fluorimetric imaging was performed according to the standard protocol by Spehr et al.22 SUM149PT cells were exposed to capsaicin two to three times for 30–60 s, depending on the experimental approach. The concentrations ranged from 3–10 µM to 500 µM. The inhibitors ruthenium red and capsazepin were co-applied at concentrations of 5 and 10 µM. ATP (10 µM) served as a control and was applied after every measurement. SUM149PT cells were seeded at a density of 5 × 103 cells in 96-well plates. After 24 h of cultivation, the cells were stimulated with RPMI + capsaicin (150 and 200 µM) and RPMI + 0.1% DMSO. The CyQuant® NF assay (Thermo Fisher Scientific) was used according to the manufacturer’s protocol. Excitation at 485/20 nm and fluorescence detection at 528/20 nm were measured to calculate fluorescence intensities. The apoptosis assay was performed by staining the SUM149PT cells with FITC-labeled Annexin V and propidium iodide (PI), using the Annexin V-FITC Apoptosis Detection Kit (Abcam), according to the manufacturer’s instructions. In brief, SUM149PT cells were treated with capsaicin (10 and 150 µM) or control for 48 h. The cells were washed twice with phosphate-buffered saline (PBS) and were resuspended with the Annexin V binding buffer. Then, the cells were incubated with FITC-labeled Annexin V and PI for 15 min in the dark at room temperature. For detection, a fluorescence microscope (Axioskop; Zeiss, Oberkochen, Germany) was used. For the detection of apoptosis, the Caspase-3 Colorimetric Assay Kit by Abcam was used according to the manufacturer’s protocol. SUM149PT cells were seeded and incubated on 12 mm coverslips and placed in 24-well plates containing medium. The medium was replaced by medium containing capsaicin (150 µM) or DMSO for 14 h. Cells were fixed for 20 min with 4% paraformaldehyde (PFA) and were washed twice with 2 mL of PBS + Triton X-100 for 10 min. The cells were blocked for 60 min with blocking buffer (PBS, 10% fish gelatin, 0.5% goat serum) at room temperature. Primary antibody-detecting caspase-3 (diluted 1:300 in blocking solution) was incubated overnight at 4°C. Before incubation for 1 h with the secondary antibody (purchased from Cell Signaling) at 1:1000 dilution including 2 µL of 4¢,6-diamidino-2-phenylindole, the cells were washed thrice with PBS + TritonX-100. The cells were fixed with ProLong® Gold Antifade. Analysis was performed with an LSM 510 Meta (Zeiss). SUM149PT cells were grown on coverslips in 24-well cell culture plates. PFA at a concentration of 4% was used for fixation of the cells. After fixation, the cells were washed and permeabilized in PBS-/- + 0.1% Triton X-100. The blocking reagent contained phosphate buffered saline tween-20 + 1% fish gelatin and was incubated for 1 h at room temperature. The TRPV1 antibody was incubated overnight at 4°C. Subsequently, the cells were washed three times, and the secondary antibody coupled to Alexa Fluor 488 (Thermo Fisher Scientific) was added for 45 min at room temperature. To analyze the images, a Zeiss LSM 510 Meta confocal microscope (Zeiss) was used. Every result was tested for normality (Shapiro–Wilk test) and equal variance. Normally distributed data were analyzed using Student’s two-tailed unpaired t-test. Data that were not normally distributed were analyzed by the Mann–Whitney U test. Every result contained at least three independent experiments so that the mean standard error of the mean is shown. Statistical significance was indicated as follows: *p<0.05, **p<0.01, ***p<0.001. 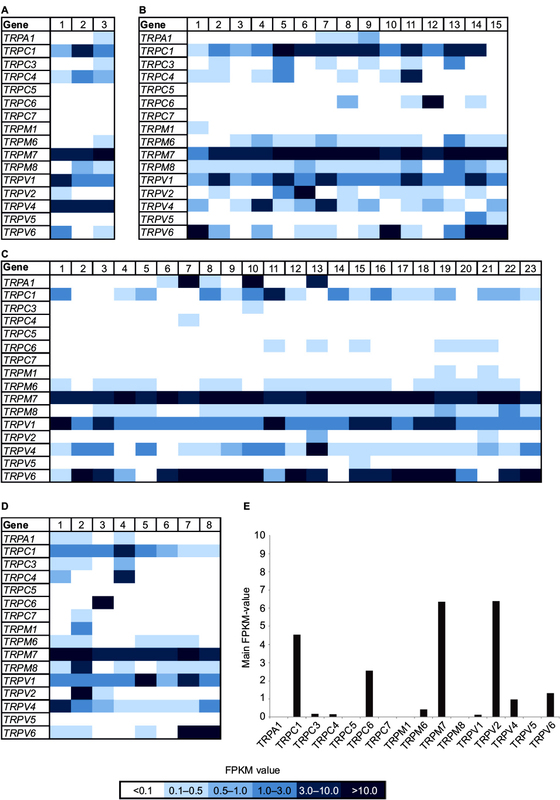 Several studies have demonstrated the influence of some TRP channels on breast cancer cell progression.25–27 Therefore, we aimed to identify the expression patterns of 16 human TRP channels in native breast cancer tissues and cell lines, and we analyzed the transcriptome of 11 different breast cancer tissues via RNA-Seq (Figure 1). We investigated the tissue samples in cooperation with the CCG and generated at least five Mio reads for each sample, using paired-end sequencing analysis and reanalyzed the data sets from the NCBI archive. In this study, we could detect a broad range of TRP channels with high expression values (FPKM > 10) in different breast cancer tissues. Figure 1 Heat map of TRP channel expression in 11 native human breast cancer tissues and four healthy breast tissues. 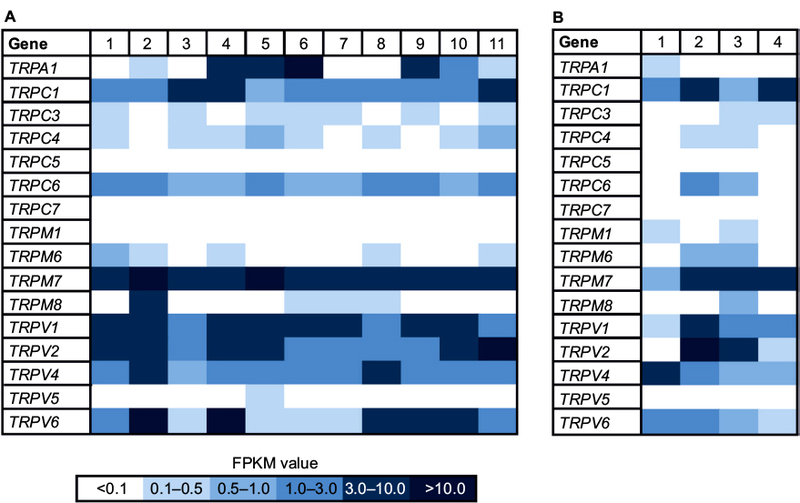 Notes: (A) Heat map shows FPKM values for the different TRP channels expressed in 11 breast cancer tissues. RNA-Seq data were generated in cooperation with the CCG. FPKM values are visualized by different colors. The expression level correlates with the color depth. TRP channels are sorted by the sum of their expression values across all tissues. (B) Heat map shows FPKM values for the different TRP channels expressed in four healthy breast tissues. Abbreviations: CCG, Cologne Center for Genomics; FPKM, fragments per kilobase of exon per million fragments mapped; TRP, transient receptor potential. In addition, we reanalyzed the transcriptome data of 49 breast cancer cell lines originating from several different tumor types (Figure 2) with focus on the expression of TRP channels. In this study, we used the innovative classification of breast cancer subtypes, revealed by extensive genomic analyses of breast cancer tissues and based on the molecular profiles of the cells, for example, luminal A, luminal B, basal-like, triple-negative, or BRCA1 mutated.28,29 There were only two TRP channels expressed in every tissue sample, namely TRPM7 and TRPV1 (Figure 2). Because TRPM7 is known to be expressed in a large number of different other cell types,30 it could not be considered a suitable, specific target for cancer therapy. In comparison, TRPV1 is not expressed in such a broad range; furthermore, it is associated with breast tumor growth inhibition.8,31,32 We showed the average expression level of TRP channels in breast cancer cell lines and the expression in healthy breast tissues, using data obtained from the Gtex database (www.gtexportal.org; Figure 2E). TRPV1 was overexpressed in breast cancer tissues compared to normal breast tissues. Some TRP channels were expressed in neither tumor tissues nor healthy tissues, for example, TRPC5 and TRPC7. TRPA1 was differentially expressed; there was no expression in healthy breast tissues but particular expression in some luminal breast tumors. Another interesting TRP channel is TRPM8, which was not expressed in healthy breast tissues but was expressed in many breast cancer samples, regardless of the subgroup. An almost contrary effect could be observed for TRPV2, showing a high expression (FPKM > 6) in healthy breast tissues but low to almost no expression in the different breast cancer subtypes. Strikingly, the luminal breast cancer subtype showed the least expression, and in the majority of samples no expression existed at all. Figure 2 Heat map of TRP channel expression in 49 breast cancer cell lines and healthy tissues. Notes: (A) Breast cancer cell lines derived from tumors with mutated BRCA1 genes; n = 3. (B) Breast cancer cell lines derived from basal-like breast tumors; n = 15. (C) Breast cancer cell lines derived from luminal breast tumors; n = 23. (D) Breast cancer cell lines derived from triple-negative breast tumors; n = 8. (E) Expression of the 16 TRP channels observed in healthy breast tissues (n = 214, data obtained from Gtex, www.gtexportal.org). FPKM values are visualized by different colors. The expression level correlates with the color depth. Abbreviations: FPKM, fragments per kilobase of exon per million fragments mapped; TRP, transient receptor potential. 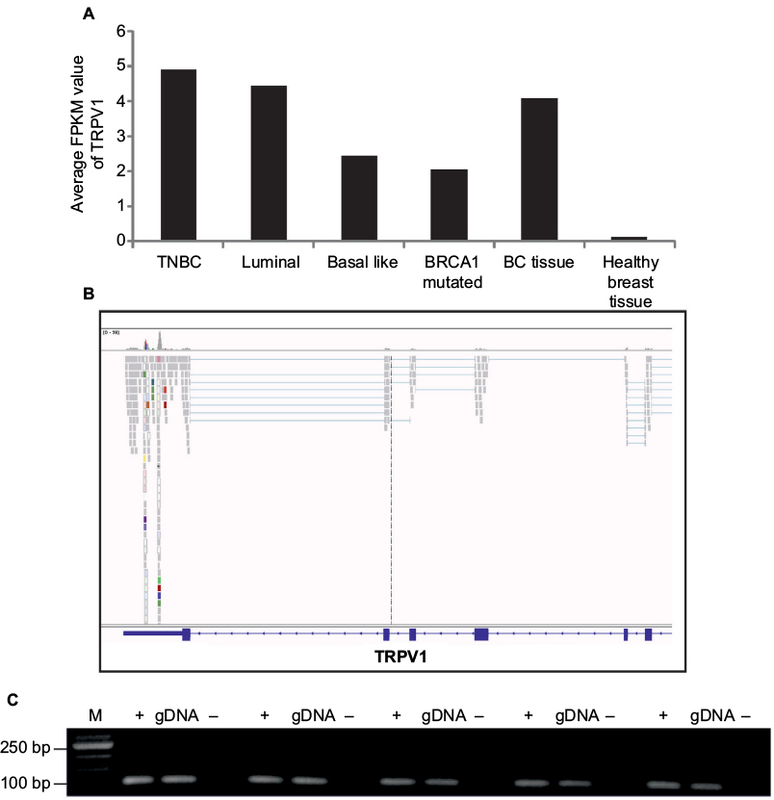 With an average FPKM value of 4.9, TRPV1 showed the highest expression in triple-negative breast cancer cells (Figure 3A). Therefore, we focused on the investigation of TRPV1 and validated the expression of TRPV1 in breast cancer tissue samples via RT-PCR (Figure 3). Figure 3 Expression of TRPV1 in breast cancer tissues and cell lines. Notes: (A) Comparison of expression of TRPV1 in all breast cancer subtypes investigated. (B) Read coverage of TRPV1 detected in one of the breast cancer tissue samples and visualized by the Integrative Genomic Viewer. (C) Validation of TRPV1 expression in five breast cancer tissue samples via RT-PCR. +, +RT, cDNA; -, -RT, RNA; gDNA, genomic DNA as a control. Abbreviations: BC, breast cancer; M, marker; PCR, polymerase chain reaction; RT, reverse transcriptase; TNBC, triple-negative breast cancer. We analyzed the function of TRPV1 in SUM149PT cells, which were developed from an invasive, inflammatory triple-negative ductal carcinoma, one of the most aggressive breast cancer types. Figure 4 shows the self-generated RNA-Seq data of SUM149PT cells, as well as the expression of TRPV1 at the mRNA and protein levels via RT-PCR and immunocytochemistry, using specific TRPV1-detecting antibodies (Figure 4B and C). 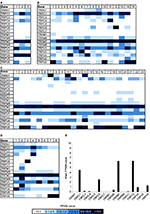 Figure 4 Expression profiles of TRP channels in the SUM149PT breast cancer cell line. Notes: (A) NGS-based RNA-Seq analysis of the expression of TRP channels. 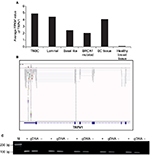 (B) Validation of the expression of TRPV1 in SUM149PT cells via RT-PCR. +, +RT, cDNA; -, -RT, RNA; g, genomic DNA as a control. (C) Immunocytochemical staining of SUM149PT cells with specific TRPV1 antibodies. Left: SUM149PT cells. Right: Negative control: SUM149PT cells stained with secondary antibody alone. Staining of the cell nuclei was performed using DAPI (blue). Scale bar: 10 µm. Abbreviations: DAPI, 4¢,6-diamidino-2-phenylindole; M, marker; NGS, next-generation sequencing; PCR, polymerase chain reaction; RT, reverse transcriptase; TRP, transient receptor potential. To analyze the function of TRPV1 in SUM149PT cells, we investigated the effect of ligand (capsaicin) stimulation. We conducted calcium imaging experiments and could elicit calcium signals at the concentration of 100 µM capsaicin (Figure 5A and B), which were abolished by coapplication of the TRPV1 antagonist capsazepin (Figure 5F). In total, 10% of the cells could be activated by capsaicin at the concentration of 10 µM, and ~20% of the cells showed calcium signals upon stimulation with 100 µM capsaicin in calcium imaging experiments. Next, we investigated the physiological effects of capsaicin by migration and proliferation assays. Stimulation of SUM149PT cells with capsaicin (150 µM) for 48 h induced a significant reduction in cell proliferation (Figure 5C). Furthermore, we performed scratch assays, which are used to analyze cell migration. When stimulated with capsaicin (150 µM) for 48 h, the cells showed a reduced migration into the gap and altered their morphology, indicating cell transition into apoptosis (Figure 5D). Therefore, we performed immunocytochemical staining for the detection of apoptosis and necrosis, using the Annexin V-FITC Kit, which allowed for differentiation among early apoptotic cells, necrotic cells, and viable cells (Figure 5E). Stimulation with capsaicin (10 and 150 µM) induced apoptotic and necrotic cell death (Figure 5E). Approximately 37% of the cells became necrotic upon stimulation with capsaicin (150 µM). Then, we examined whether the capsaicin-induced effect on cell proliferation was mediated by TRPV1 using the TRPV1-specific antagonist capsazepin (50 µM). The reduction in cell proliferation was diminished by the coapplication of capsaicin (50 µM) and capsazepin (50 µM) in comparison to capsaicin alone (Figure 5G). Figure 5 Functional characterization of TRPV1 activation by capsaicin in SUM149PT cells. Notes: (A) Representative image of SUM149PT cells stimulated with capsaicin (10 µM) in calcium imaging analysis. To ensure the viability of the cells, ATP (10 µM) was applied finally and served as a positive control. N > 3 with n = 12 measurements in six cell culture dishes with ~200 cells. (B) Activation of SUM149PT cells upon repetitive capsaicin application (10 µM). (C) Analysis of cell proliferation via CyQuant proliferation assay after capsaicin stimulation for 48 h (150 µM); n = 20. (D) Analyses of cell migration by scratch assay after capsaicin (150 µM) stimulation for 48 h. Bar chart showing statistical analysis of the area overgrown in scratch assay experiments; n = 3 assays. (E) Annexin V-FITC staining of SUM149PT cells stimulated by capsaicin (10 and 150 µM). Early apoptotic cells (Annexin V positive, PI negative) are shown in green; necrotic cells (Annexin V positive, PI positive) are shown in yellowish-red, and viable cells are shown in bright phase (Annexin V negative, PI negative). Bar chart showing statistical analysis of cells undergoing necrosis; n = 3 stains of five slices with ~300 cells. (F) Calcium signal upon application of capsaicin (100 µM) and capsaicin (100 µM) + capsazepin (50 µM); n = 6 cell culture dishes with ~200 cells. The shaded area represents the application of the antagonist capsazepin. (G) Analysis of the cell proliferation via CyQuant proliferation assay after capsaicin (50 µM) and capsaicin (50 µM) + capsazepin (50 µM) stimulation for 48 h; n = 10. *P<0.05, ***P<0.001. Scale bar = 10 µm. Abbreviations: C, capsaicin; CZ, capsazepin; FITC, fluorescein isothiocyanate; PI, propidium iodide; F340/F380, ratio of the fluorescence intensities at 340 nm and 380 nm excitation; C, capsaicin; CZ, capsazepin; ATP, adenosine triphosphate; ns, not significant. Calcium imaging experiments revealed the functionality of TRPV1 in SUM149PT cells. 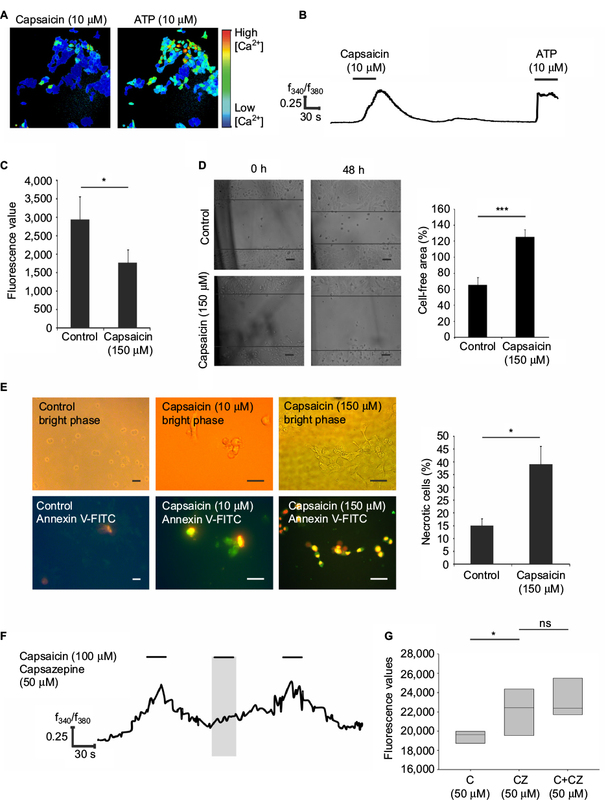 In this study, the stimulation of the cells with its ligand capsaicin led to strong calcium increases in the cells, which could be diminished by the coapplication of the specific inhibitor capsazepin and the unspecific inhibitor ruthenium red. After we proved the existence and functionality of TRPV1, we conducted proliferation and migration analyses to investigate the long-term effects of capsaicin on SUM149PT cells. In a study by Sanchez et al,43 the role of TRPV1 in prostate cancer cell proliferation was analyzed. In our experiments, a significant reduction in cell proliferation after capsaicin stimulation was observed, diminished by the coapplication of capsazepin. This finding was in accordance with the results of Vercelli et al,43 who demonstrated a significant decrease in the cell growth rate of MCF-7 breast cancer cells upon capsaicin stimulation. Interestingly, Zheng et al44 furthermore showed that capsaicin was capable of enhancing the antineoplastic effects of pirarubicin, which is an analog of the antibiotic doxorubicin.45 In HCT116 cells, the inhibition of cell proliferation by TRPV1 signaling was demonstrated as well. We showed the induction of apoptosis and necrosis upon capsaicin stimulation, in accordance with a study of TRPV1 in prostate cancer cells, in which its activation by capsaicin led to the induction of necrotic cell death.46 This induction led to the suggestion that activation of TRPV1 by specific ligands could significantly enhance breast cancer cell death, even in the most aggressive breast cancer subtype, triple-negative breast cancer. The mechanisms involved leading to apoptosis remain elusive. We conducted a meta-study of the expression patterns of all human TRP channels in different breast cancer subtypes and showed that TRPM7 and TRPV1 were the only channels expressed in every sample. Furthermore, TRPV1 showed the highest average expression in triple-negative breast cancer subtypes. Analyzing channel activation, we demonstrated anti-proliferative, anti-migratory and apoptosis/necrosis-inducing effects of capsaicin treatment due to the activation of TRPV1 in SUM149PT cells, which is a model system for triple-negative inflammatory breast cancer, the most aggressive breast cancer subtype. Desmedt C, Voet T, Sotiriou C, Campbell PJ. Next-generation sequencing in breast cancer: first take home messages. Curr Opin Oncol. 2012;24(6):597–604. Garraway LA, Lander ES. Lessons from the cancer genome. Cell. 2013;153(1):17–37. Karn T. High-throughput gene expression and mutation profiling: current methods and future perspectives. Breast Care (Basel). 2013;8(6):401–406. OPYRCHAL M, SALISBURY JL, IANKOV I, et al. Inhibition of Cdk2 kinase activity selectively targets the CD44+/CD24− Low stem-like subpopulation and restores chemosensitivity of SUM149PT triple-negative breast cancer cells. Int J Oncol. 2014;45(3):1193–1199. Navratil J, Fabian P, Palacova M, et al. Triple negative breast cancer. Klin Onkol. 2015;28(6):405–415. Benemei S, Patacchini R, Trevisani M, Geppetti P. TRP channels. Curr Opin Pharmacol. 2015;22:18–23. Bodding M. TRP proteins and cancer. Cell Signal. 2007;19(3):617–624. Ramsey IS, Delling M, Clapham DE. An introduction to TRP channels. Annu Rev Physiol. 2006;68:619–647. Shapovalov G, Ritaine A, Skryma R, Prevarskaya N. Role of TRP ion channels in cancer and tumorigenesis. Semin Immunopathol. 2016;38(3):357–369. Mistretta F, Buffi NM, Lughezzani G, et al. Bladder cancer and urothelial impairment: the role of TRPV1 as potential drug target. Biomed Res Int. 2014;2014:987149. Amantini C, Mosca M, Nabissi M, et al. Capsaicin-induced apoptosis of glioma cells is mediated by TRPV1 vanilloid receptor and requires p38 MAPK activation. J Neurochem. 2007;102(3):977–990. Pramanik KC, Boreddy SR, Srivastava SK. Role of mitochondrial electron transport chain complexes in capsaicin mediated oxidative stress leading to apoptosis in pancreatic cancer cells. PLoS One. 2011;6(5):e20151. Kim YM, Hwang JT, Kwak DW, Lee YK, Park OJ. Involvement of AMPK signaling cascade in capsaicin-induced apoptosis of HT-29 colon cancer cells. Ann N Y Acad Sci. 2007;1095:496–503. Clark R, Lee S. Anticancer properties of capsaicin against human cancer. Anticancer Res. 2016;36(3):837–843. Bley K, Boorman G, Mohammad B, McKenzie D, Babbar S. A comprehensive review of the carcinogenic and anticarcinogenic potential of capsaicin. Toxicol Pathol. 2012;40(6):847–873. Jin T, Wu H, Wang Y, Peng H. Capsaicin induces immunogenic cell death in human osteosarcoma cells. Exp Ther Med. 2016;12(2):765–770. Ferreira AK, Tavares MT, Pasqualoto KFM, et al. RPF151, a novel capsaicin-like analogue: in vitro studies and in vivo preclinical antitumor evaluation in a breast cancer model. Tumour Biol. 2015;36(9):7251–7267. Li H, Handsaker B, Wysoker A, et al. The sequence alignment/map format and SAMtools. Bioinformatics. 2009;25(16):2078–2079. Trapnell C, Roberts A, Goff L, et al. Differential gene and transcript expression analysis of RNA-seq experiments with TopHat and Cufflinks. Nat Protoc. 2012;7(3):562–578. Spehr M, Gisselmann G, Poplawski A, et al. Identification of a testicular odorant receptor mediating human sperm chemotaxis. Science. 2003;299(5615):2054–2058. Busse D, Kudella P, Gruning N, et al. 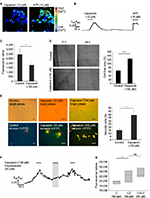 A synthetic sandalwood odorant induces wound-healing processes in human keratinocytes via the olfactory receptor OR2AT4. J Invest Dermatol. 2014;134(11):2823–2832. Gebäck T, Schulz MM, Koumoutsakos P, Detmar M. TScratch: a novel and simple software tool for automated analysis of monolayer wound healing assays. Biotechniques. 2009;46(4):265–274. Meng X, Cai C, Wu J, et al. TRPM7 mediates breast cancer cell migration and invasion through the MAPK pathway. Cancer Lett. 2013;333(1):96–102. Wu TT, Peters AA, Tan PT, Roberts-Thomson SJ, Monteith GR. 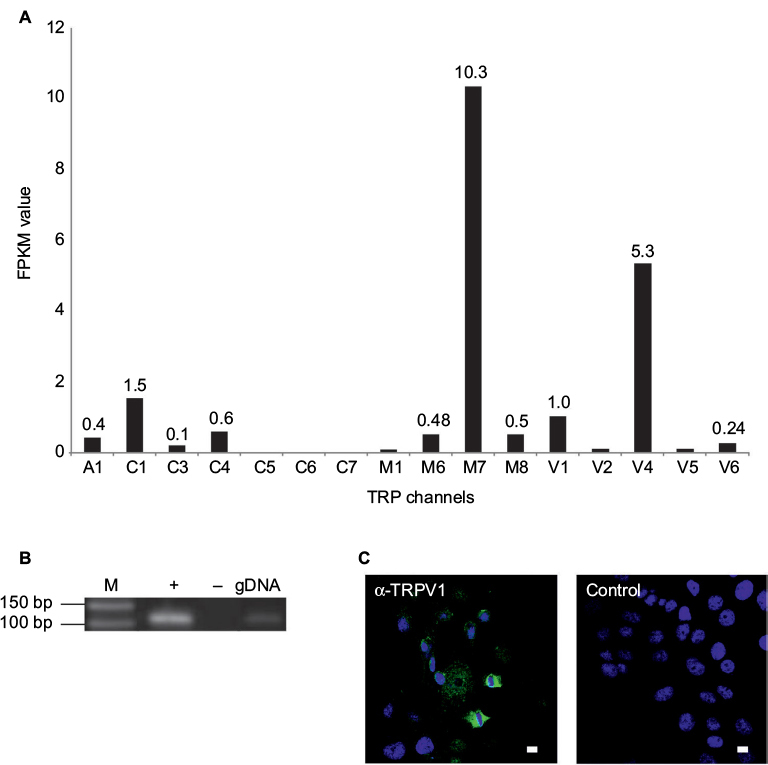 Consequences of activating the calcium-permeable ion channel TRPV1 in breast cancer cells with regulated TRPV1 expression. Cell Calcium. 2014;56(2):59–67. Liu ZF, Chen C, Yao XL, et al. Clinicopathological characteristics and prognosis of different molecular types of breast cancer. Zhonghua Yi Xue Za Zhi. 2016;96(22):1733–1737. Berse B, Lynch JA. Molecular diagnostic testing in breast cancer. Semin Oncol Nurs. 2015;31(2):108–121. Paravicini TM, Chubanov V, Gudermann T. TRPM7: a unique channel involved in magnesium homeostasis. Int J Biochem Cell Biol. 2012;44(8):1381–1384. Lazzeri M, Vannucchi MG, Spinelli M, et al. Transient receptor potential vanilloid type 1 (TRPV1) expression changes from normal urothelium to transitional cell carcinoma of human bladder. Eur Urol. 2005;48(4):691–698. Bode AM, Cho Y, Zheng D, et al. The transient receptor potential type vanilloid 1 suppresses skin carcinogenesis. Cancer Res. 2009;69(3):905–913. Zhou W, Guo S, Xiong Z, Liu M. Oncogenic role and therapeutic target of transient receptor potential melastatin 7 channel in malignancy. Expert Opin Ther Targets. 2014;18(10):1177–1196. Yee NS. Roles of TRPM8 ion channels in cancer: proliferation, survival, and invasion. Cancers (Basel). 2015;7(4):2134–2146. Yee NS. TRPM8 ion channels as potential cancer biomarker and target in pancreatic cancer. Adv Protein Chem Struct Biol. 2016;104:127–155. Marincsak R, Toth BI, Czifra G, et al. Increased expression of TRPV1 in squamous cell carcinoma of the human tongue. Oral Dis. 2009;15(5):328–335. Miao X, Liu G, Xu X, et al. High expression of vanilloid receptor-1 is associated with better prognosis of patients with hepatocellular carcinoma. Cancer Genet Cytogenet. 2008;186(1):25–32. Sharma SK, Vij AS, Sharma M. Mechanisms and clinical uses of capsaicin. Eur J Pharmacol. 2013;720(1–3):55–62. Vercelli C, Barbero R, Cuniberti B, Odore R, Re G. Expression and functionality of TRPV1 receptor in human MCF-7 and canine CF.41 cells. Vet Comp Oncol. 2015;13(2):133–142. Yang F, Zhang W, Shen Y, Guan X. Identification of dysregulated microRNAs in triple-negative breast cancer (review). Int J Oncol. 2015;46(3):927–932. Park YR, Chun JN, So I, et al. Data-driven analysis of TRP channels in cancer: linking variation in gene expression to clinical significance. Cancer Genomics Proteomics. 2016;13(1):83–90. Sanchez MG, Sanchez AM, Collado B, et al. Expression of the transient receptor potential vanilloid 1 (TRPV1) in LNCaP and PC-3 prostate cancer cells and in human prostate tissue. Eur J Pharmacol. 2005;515(1–3):20–27. Vercelli C, Barbero R, Cuniberti B, et al. Transient receptor potential vanilloid 1 expression and functionality in mcf-7 cells: a preliminary investigation. J Breast Cancer. 2014;17(4):332–338. Zheng L, Chen J, Ma Z, et al. Capsaicin enhances anti-proliferation efficacy of pirarubicin via activating TRPV1 and inhibiting PCNA nuclear translocation in 5637 cells. Mol Med Rep. 2016;13(1):881–887. Dhingra K, Frye D, Newman RA, et al. Phase II clinical and pharmacological study of pirarubicin in combination with 5-fluorouracil and cyclophosphamide in metastatic breast cancer. Clin Cancer Res. 1995;1(7):691–697. Ziglioli F, Frattini A, Maestroni U, Dinale F, Ciufifeda M, Cortellini P. Vanilloid-mediated apoptosis in prostate cancer cells through a TRPV-1 dependent and a TRPV-1-independent mechanism. Acta Biomed. 2009;80(1):13–20.